Posted by elizabethwong in "We can do better", Human Rights, Malaysia, Politics. One could hear those young trainees wailing and crying out in pain. What have you got to say, Najib – Defence Minister? How long has this been going on? Will we see the Prime Minister ordering an expeditious enquiry and prosecution? Please don’t pretend this was the first time the Government has heard about this. And if this is happening to our own citizens, just imagine how asylum-seekers and undocumented workers are being treated in our detention camps. Charge ’em. Charge the oil palm plantation owner who allowed this on his/her property. Make Malaysia a torture-free country. Posted by elizabethwong in "We can do better", Current Affairs, Democracy, Human Rights, Malaysia, Politics. C’mon guys. All paperwork, even of MPs and ADUNs (state assemblymen), should be transferred over and there should be a proper transition. Like when an office has new staff coming in or after a company takeover. How about itsy-bit of professionalism here? Monday, 17 March 2008All documents from the offices of the Mentri Besar and executive councillors in Kedah have gone missing. The PAS-led government which took office after 12th general election on March 8 will lodge a police report based on the findings of an internal investigation. Mentri Besar Azizan Abdul Razak has appointed state executive councillor Phahrolrazi Zawawi to investigate the case of the missing documents. “Phahrolrazi will investigate what happened. “I do not want to accuse people without proof,” said Azizan who found that the Mentri Besar’s office was void of documents after the swearing-in ceremony last Sunday. The newly appointed executive councillors, who were sworn in on Wednesday, found out the next day that their offices were also empty. “There is not a single paper left in all the offices. We view this very seriously because the documents belong to the executive council, not to any individual,” said Phahrolrazi. He said most of the documents were classified. “We are questioning the government officers on duty. No one has a right to transfer the documents without permission,” he said. Phahrolrazi said the former executive councillors did not have the right to enter the offices without permission. PENANG (March 17, 2008): The new state executive councillors (excos) started their first week in office to govern with a clean sheet, literally. They found their offices cleared of all government documents and minutes of the previous Barisan Nasional (BN) government. All records of projects, completed or current, approved by the previous government are missing. “They (the previous exco) claim the documents are ‘personal property’ and cleared the offices,” he told reporters. The new line-up would have to get copies of the documents from the state secretary’s office. “We have the resources to track down these documents. They (state secretary office) would still have copies of whatever ‘approval’ documents. If the documents are not approved yet, they still have to come back to the exco for approval,” he said. Public Works, Utilities and Transport Committee chairman Lim Hock Seng said “we have to start from scratch”. “We will have to go and get copies from various department heads on previous projects,” he said. Phee said the previous exco members did not follow the conduct of former Chief Minister Tan Sri Dr Koh Tsu Koon who has been a gentleman all the way. “If they (the previous exco) really loved the people, they should not have used such obstructions to try and stop us,” said Phee. In Alor Star, the PAS-led Kedah government also found all documents in the offices of the Mentri Besar and excos missing when they took office after the 12th General Election on March 8. Mentri Besar Azizan Abdul Razak has appointed state executive councillor Phahrolrazi Zawawi to probe the case of “missing government documents”. Posted by elizabethwong in "We can do better", Current Affairs, Democracy, Economy, Human Rights, Malaysia, Politics, Race Relations. Let there be no confusion about this. Parti Keadilan Rakyat (People’s Justice Party) has a clear and firm stand on the New Economic Policy (NEP). As explained by the Ketua Umum of the Party, Anwar Ibrahim in his 20-page article as well as through his many public pronouncements and ceramah, and further reaffirmed in several Party documents, including the Election Manifesto, we intend to replace the NEP with the Malaysian Economic Agenda. The NEP, after nearly 40 years is already anachronistic. It has been abused by a handful leaders and cronies in Umno-Bn to rob the country of its wealth to enrich themselves, in the name of the Malays as a whole. It has led to discriminatory practices that are against the spirit of justice and fairness for all Malaysians, particularly the poor, marginalised and disadvantaged groups of all races. (e) generate pro-people development and strengthen the competitive capacity of Malaysia so that she can stand tall with all developed countries, starting with those in Asia. Those leaders of Umno-Bn and the media they own that accuse Parti Keadilan Rakyat as having no stand on the NEP and on other ways of improving the lot of the poor, marginalized and disadvantaged Malays are deliberately indulging in lies to mislead the public. We wish to emphasise that a policy of positive discrimination in favour of all Malaysians who are poor, marginalized and disadvantaged will benefit the Malay rakyat more, because they form the big majority of this category of people. Posted by elizabethwong in "We can do better", Current Affairs, Democracy, Economy, Malaysia, Politics. Fortunately, some members of the media caught this on camera. Unfortunately, we can’t march right in to stop them because (i) we haven’t been sworn in; (ii) police has cordoned off the state office since Saturday night. Posted by elizabethwong in "We can do better", Current Affairs, Democracy, Malaysia, Politics. 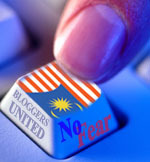 (Malaysiakini) A real carnival atmosphere was evident at PKR’s de facto Anwar Ibrahim’s house in Segambut last night. The reason was obvious – the party has had its best ever results in a general election, winning 31 parliamentary and 40 state seats. The manner in which the party’s new Yang Berhormats patted each other on the back and shook hands, it was evident that this was a significant achievement for the party. More interestingly, they had achieved this as a single party with three different races fighting on issues for everyone instead of their own communities.